In Spiritualism, psychic senses used by mental mediums are sometimes defined differently than in other paranormal fields. The term clairvoyance, for instance, may be used by Spiritualists to include seeing spirits and visions instilled by spirits, whereas the Parapsychological Association defines "clairvoyance" as information derived directly from an external physical source. When forming your personal Paranormal Team the powers of a psychic, medium or person that channels ghosts is becoming a very important valu able factor. The power or powers that they might possess are very important in locating and understanding a real ghost or haunting. No matter what the depth of their ablities it is a crucial aspect that can put your particular investigation over the top. To understand more of what a real Paravoyer can do you need to undertand their abilities to each degree and use them wisely. Real Para- Voyant individuals as they are called these days are like bloodhounds to a large a degree. the see, sniff, feel and will follow a ghost through out a location. Highly developed levels ESP you either have it or you don't! Extrasensory perception (ESP) is the apparent ability to acquire information by paranormal means independent of any known physical senses or deduction from previous experience. The term was coined by Duke University researcher J. B. Rhine to denote psychic abilities such as telepathy, the sensing of thoughts or feelings without help from the 5 known senses, precognition, the knowledge of future events, and clairvoyance, the awareness of people, objects or events without the help of the 5 known senses. ESP is also sometimes casually referred to as a sixth sense, gut instinct, a hunch, a weird vibe or an intuition. The term implies sources of information currently unexplained by science. Popular belief in ESP is widespread, but skeptics are still not persuaded that there truly is a sixth sense because of the lack of reliable theories and information. Online variations of Zener card tests currently exist on the internet. If properly constructed, tests of this nature can circumvent the issues of bias and cheating common to standard Zener card tests. One such online system, the Anima Project , gathers user results into a master database which is then analyzed using a variety of statistical techniques. Clairsentience or "Clear Sensing", is the ability to have an impression of what a spirit wants to communicate, or to feel sensations instilled by a spirit. the field of parapsychology, clairsentience is a form of extra-sensory perception wherein a person acquires psychic knowledge primarily by means of feeling or touching an object. The word is from the French clair, “clear,” + sentience, “feeling,” and is ultimately derived from the Latin clarus, “clear,” + sentiens, derived from sentire, “to feel”. Psychometry is related to clairsentience. The word stems from psyche and metric, which means "to measure with the mind". Psychometry (Greek: psukhe, "spirit, soul"; + metron, "measure") is a form of extra-sensory perception in which a psychic is said to be able to obtain information about an individual through paranormal means by making physical contact with an object that belongs to them. In recent years, the term has been superseded in favor of "token-object reading" so as to avoid potential confusion with the psychological term, "psychometry". The term psychometry was coined by Joseph Rodes Buchanan in 1842. Buchanan developed the theory that all things give off an emanation. "The past is entombed in the present, the world is its own enduring monument; and that which is true of its physical is likewise true of its mental career. The discoveries of Psychometry will enable us to explore the history of man, as those of geology enable us to explore the history of the earth. There are mental fossils for psychologists as well as mineral fossils for the geologists; and I believe that hereafter the psychologist and the geologist will go hand in hand, the one portraying the earth, its animals and its vegetation, while the other portrays the human beings who have roamed over its surface in the shadows, and the darkness of primeval barbarism. Aye, the mental telescope is now discovered which may pierce the depths of the past and bring us in full view of the grand and tragic passages of ancient history.. 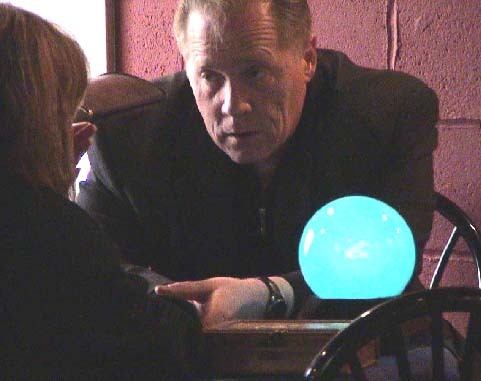 The concept of psychometry is a popular theme for stage act and Séance; with participants being asked to provide a personal object to be "read" by a medium or psychic. It was used as the basis for Johnny Smith's visions in Stephen King's 1979 novel The Dead Zone and its subsequent 2002 television adaption. Clairalience or "Clear Smelling" is the ability to smell a spirit. Some people claim to smell exotic perfume or flowers or cigar smoke, things like that, when a real ghost is near. Yvonne Brown a Florida Resident who can smell when ghosts where around her. This phenomena has been reported by many who search for the lost souls of the dead in the paranormal zone. In Browns view ghosts have various odors associated with them and no to specters or spooks smell the same. Please see : The Real Scent Of A Ghost! Also see: I Smell Dead People... I mean Ghosts! Olfaction, the sense of smell, the ability of humans and other animals to perceive odors. As described by the Roman philosopher Lucretius (1st Century BCE), different odors are attributed to different shapes and sizes of odor molecules that stimulate the olfactory organ. The modern counterpart to that theory was the cloning of olfactory receptor proteins by Linda B. Buck and Richard Axel (who were awarded the Nobel Prize in 2004), and subsequent pairing of odor molecules to specific receptor proteins. Each odor receptor molecule recognizes only a particular molecular feature or class of odor molecules. Mammals have about a thousand genes expressing for odor reception. Of these genes, only a portion are functional odor receptors. Humans have far fewer active odor receptor genes than other mammals and primates. Each olfactory receptor neuron expresses only one functional odor receptor. Odor receptor nerve cells function like a key-lock system: If the airborne molecules of a certain chemical can fit into the lock, the nerve cell will respond. There are, at present, a number of competing theories regarding the mechanism of odor coding and perception. According to the shape theory, each receptor detects a feature of the odor molecule. Weak-shape theory, known as odotope theory, suggests that different receptors detect only small pieces of molecules, and these minimal inputs are combined to form a larger olfactory perception (similar to the way visual perception is built up of smaller, information-poor sensations, combined and refined to create a detailed overall perception). An alternative theory, the vibration theory proposed by Luca Turin, posits that odor receptors detect the frequencies of vibrations of odor molecules in the infrared range by electron tunnelling. However, the behavioral predictions of this theory have been called into question. As of yet, there is no theory that explains olfactory perception completely. Clairgustance or "Clear Tasting" is the ability to receive taste impressions from a spirit. In the field of parapsychology, clairgustance is defined as a form of extra-sensory perception that allegedly allows one to taste a substance without putting anything in one's mouth. It is claimed that those who possess this ability are able to perceive the essence of a substance from the spiritual or ethereal realms through taste. For a long period, it has been commonly accepted that there are a finite number of "basic tastes" by which all foods and tastes can be grouped. Just like with primary colors, these "basic tastes" only apply to the human perception, ie. the different sorts of tastes our tongue can identify. Up until the 2000s, this was considered to be a group of four basic tastes. More recently, a fifth taste, Umami, was added by a large number of authorities in this field. Claircognizance or "Clear Knowing", is the ability to know something without receiving it through normal or psychic senses. It is a feeling of "just knowing". Often, a medium will claim to have the feeling that a message or situation is "right" or "wrong." Knowledge acquisition involves complex cognitive processes: perception, learning, communication, association and reasoning. The term knowledge is also used to mean the confident understanding of a subject with the ability to use it for a specific purpose if appropriate. Symbolic representations can be used to indicate meaning and can be thought of as a dynamic process. Hence the transfer of the symbolic representation can be viewed as one ascription process whereby knowledge can be transferred. Other forms of communication include imitation, narrative exchange along with a range of other methods. There is no complete theory of knowledge transfer or communication. In psychology and the cognitive sciences, perception is the process of attaining awareness or understanding of sensory information. It is a task far more complex than was imagined in the 1950s and 1960s, when it was predicted that building perceiving machines would take about a decade, a goal which is still very far from realizable. The word perception comes from the Latin perception, percepio, , meaning "receiving, collecting, action of taking possession, apprehension with the mind or senses." What one perceives is a result of interplays between past experiences, one’s culture and the interpretation of the perceived. If the percept does not have support in any of these perceptual bases it is unlikely to rise above perceptual threshold. Perception gives rise to two types of consciousness; phenomenal and psychological. The difference everybody can demonstrate to himself/herself by simple opening and closing his/her eyes. Phenomenal consciousness is full of rich sensations that are hardly present when eyes are closed. Psychological consciousness is well researched and measured. It occurs half a second after a stimulus starts. If a weak stimulus lasts less, it is unlikely to be perceived. The capacity of psychological consciousness is also well measured. Depending on methods used the capacity ranges between seven and forty symbols or percepts at one time. There are two basic theories of perception: Passive Perception (PP) and Active Perception (PA). The passive perception (conceived by René Descartes) is addressed in this article and could be surmised as the following sequence of events: surrounding ? input (senses) ? processing (brain) ? output (re-action). Although still supported by mainstream philosophers, psychologists and neurologists, this theory is nowadays losing momentum. The theory of active perception has emerged from extensive research of sensory illusions, most notably the works of Richard L. Gregory. This theory is increasingly gaining experimental support and could be surmised as dynamic relationship between “description” (in the brain) ? senses ? surrounding. Perception is one of the oldest fields in psychology. The oldest quantitative law in psychology is the Weber-Fechner law, which quantifies the relationship between the intensity of physical stimuli and their perceptual effects. It was the study of perception that gave rise to the Gestalt school of psychology, with its emphasis on holistic approach. In the case of visual perception, some people can actually see the percept shift in their mind's eye. Others who are not picture thinkers, may not necessarily perceive the 'shape-shifting' as their world changes. The 'esemplastic' nature has been shown by experiment: an ambiguous image has multiple interpretations on the perceptual level. The processes of perception routinely alter what humans see. When people view something with a preconceived idea about it, they tend to take those preconceived ideas and see them whether or not they are there. This problem stems from the fact that humans are unable to understand new information, without the inherent bias of their previous knowledge. The extent of a person’s knowledge creates their reality as much as the truth, because the human mind can only contemplate that which it has been exposed to. When objects are viewed without understanding, the mind will try to reach for something that it already recognizes, in order to process what it is viewing. That which most closely relates to the unfamiliar from our past experiences, makes up what we see when we look at things that we don’t comprehend. This confusing ambiguity of perception is exploited in human technologies such as camouflage, and also in biological mimicry, for example by Peacock butterflies, whose wings bear eye markings that birds respond to as though they were the eyes of a dangerous predator. Perceptual ambiguity is not restricted to vision. For example, recent touch perception research (Robles-De-La-Torre & Hayward 2001) found that kinesthesia-based haptic perception strongly relies on the forces experienced during touch. This makes it possible to produce illusory touch percepts.